Paintball markers, commonly known as paintball guns, are primarily used by players to shoot the other team. Paintball is an emerging game in the United States and other more than 60 countries. Many reasons apply for motivating people to play this sport. Quick team building is one aspect that motivates people to play and enjoy the game. Secondly, people get a very healthy outlet through playing this game where fierce competition between the two groups allows them to play intensely without getting hurt. Reservations are required at Action Packed Paint Ball for private group play so make sure to give us a phone call and ask to reserve a spot for your team to play. You may also provide the complete names of your team members as well as the pseudo name of your paintball team. You can bring in your own paintball markers or rent from us; however, Action Packed Paint Ball does require you to use our paintballs, which we provide for players. 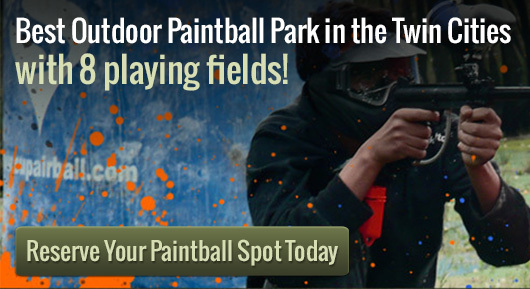 Playing paintball is a great recreational sport to pass your precious time with your friends and family. It is an organized sport, which requires optimal team spirit. One of the most popular games is ‘Capture the Flag’ in which a team has to capture the flag of another team and take it back to their own base’s ‘flag station’, while the former is defending its own flag. Artificial or natural terrain is spread across the whole field, which can be used by the players as hiding spots. Here at Action Packed Paintball we can accommodate groups of 150+. We are capable of running private games 7 days a week, dawn until dusk. Walk-on play is also available Please call us at 952-492-6776 if you have any questions or if you would like to reserve a time. Please call ahead in advance, as reservations are required.